FARC leader Timochenko has called for a network of tactical units to develop throughout Colombia (Flickr). 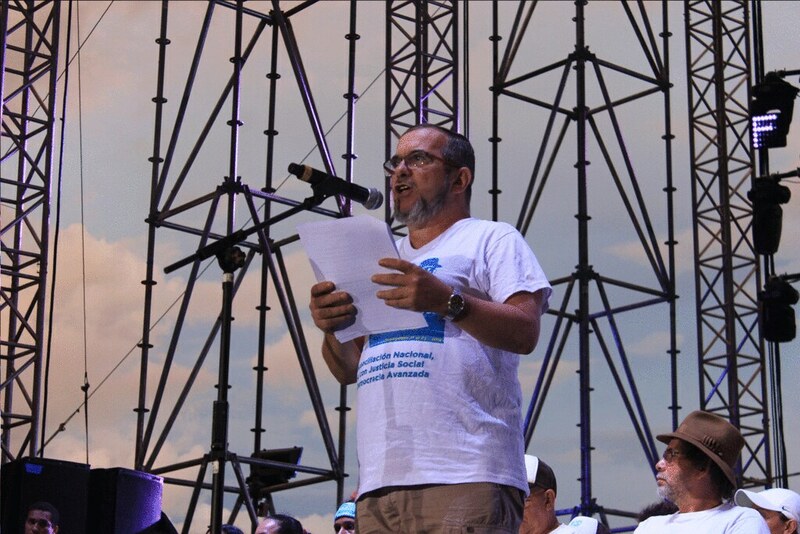 FARC presidential candidate Rodrigo Londoño, alias Timochenko, released a statement to his followers in which he calls for discipline and greater activism in the upcoming presidential campaign for 2018. Timochenko said that the guidelines for FARC policies will be made through the creation of Tactical Units of the People throughout the country that will be responsible for spreading their propaganda in which he will collect men and women from amongst the common people. After a recent incident involving “Pablo Atrato” excomandante of the FARC‘s 57th Front, and a close associate of Timochenko, he advised those who were part of the guerrilla group to ensure their safety, while taking all necessary precautions. Despite the incident, members of the FARC claimed that it was an attack against Pablo Atrato while the police have stated that it was an attempted robbery against one of the men of his security team, in which one of the alleged assailants died. On the other hand, he congratulated the men of the Colombian military and police for being those who now provide security and defend the life of the ex-guerrillas they formerly fought. “The life and safety of our party leadership, as well as the mass of our militancy, is being guaranteed by the soldiers and policemen that we fought before. An example for the world community,” said Londoño in a New Year’s greeting. Finally, Timochenko has aspirations to win the presidency, as he assured that they will triumph over the obstacles that arise along the way. Currently members of the FARC will have five seats in the Senate and five in the House of Representatives guaranteed by the peace agreement signed with the Colombian government. Critics note that this proposal follows in the same steps of the Committees of Defense of the Cuban Revolution (CDR). These committees were created on the island in the year 1960 with the purpose of carrying out tasks of collective surveillance in the face of external interference and acts of destabilization of the Cuban political system. The main objectors to this measure in Cuba assure that the structure of the CDRs has produced structures that the state controls, besides monitoring and controlling the public and private lives of the people, and watching one’s neighbors. Implementation of the FARC-Santos Agreement has been a key issue heading into Colombia’s 2018 presidential election, now less than six months away.